The problem with how I cook is that I try something and love it, then keep trying new things, and forget to go back and cook things I previously loved. This dish is one of those recipes that I cooked years ago and really loved, then I forgot about it. My husband has been catching squid recently, and when I thought about how I was going to cook it, I remembered this recipe. I am so glad I did as it was delicious. The flavour of the squid I love, but the garlic and tomato sauce you get with it, delicious, and the parmesan cheese just makes it brilliant. I had my parents over last night and I impressed them, I am very proud of myself. 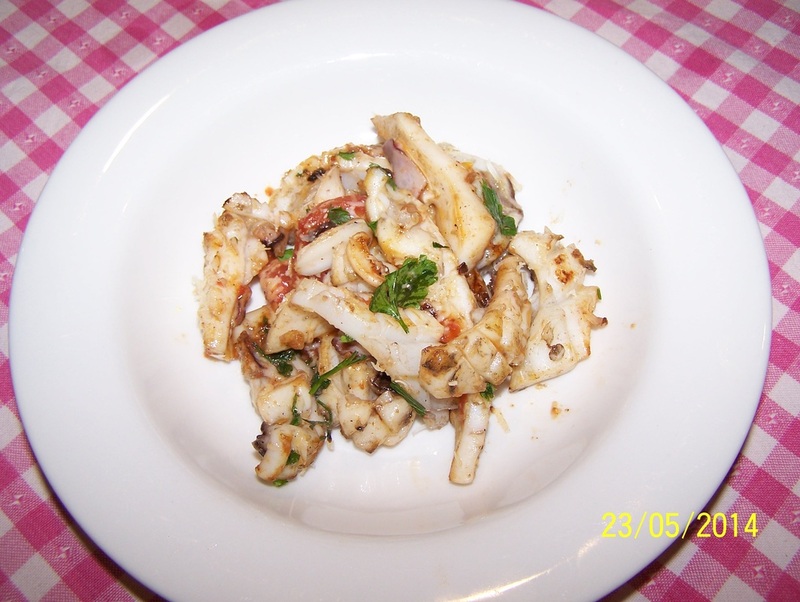 If you love squid, give this recipe a go, it is super easy and super tasty. Cut the squid hoods in half lengthways, wash and pat dry. Do not remove the skin from the squid if it is on, as it has a lovely flavour. Score a shallow lattice pattern all over the white fleshy side (inside of the hood) of the squid. Take care not to cut right through. Lay them flat, with the fleshy side up, and cut into rectangles, about 6 x 2.5cm. In a large bowl, add the garlic, oil, half of the parsley, salt and pepper. Add the squid and mix it all together, refrigerate for at least 10 minutes. You need to peel away the skin of the tomato. Score a small cross into the top of the tomato. Place in a heatproof bowl that is larger than the tomato. Fill the bowl with boiling water from the kettle to completely cover the tomato. Allow to sit for 30 seconds to a minute, then remove from heat and peel away the skin. It should come off easily. Scoop out the seeds, then chop up the flesh. Heat a lightly oiled chargrill pan or barbecue hotplate until very hot. Cook the squid in two batches, toss regularly, until the squid curls and turns white. Add the chopped tomatoes and toss through to just heat. Season with more salt and pepper, if needed. 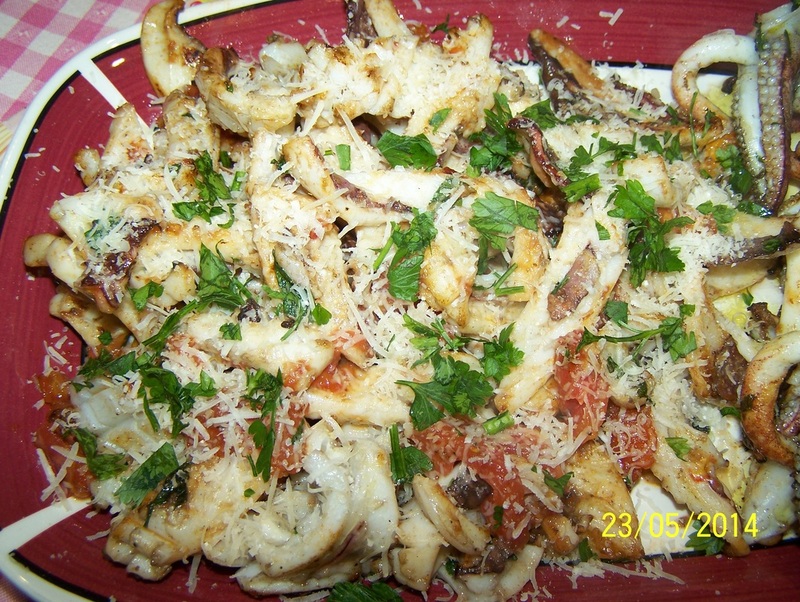 Arrange the squid on a platter and scatter over the grated parmesan and remaining parsley.